What It’s About: Justin Playfair (George C. Scott) thinks he’s Sherlock Holmes. 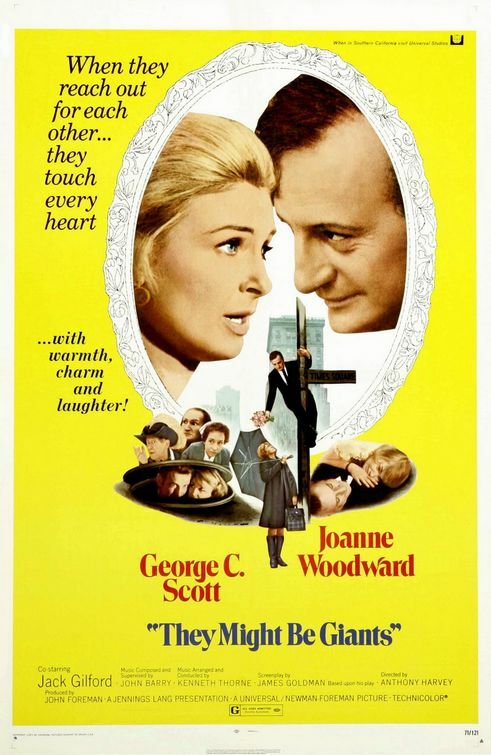 When his brother (Lester Rawlins) tries to institutionalize Playfair to gain control of Justin’s estate and pay off a crook (James Tolkan), he runs into an obstacle: Dr. Mildred Watson (Joanne Woodward), who not only refuses to do the bidding of her boss, Dr. Strauss (Ron Weyland), but ends up accompanying Playfair/Holmes while he attempts to solve the riddle of the blackmail note he found so that he might foil Dr. Moriarty. Why Watch it Today? : Today is the birthday of Dr. Watson. They Might Be Giants is a very different take on the Holmes story, mixing it with Don Quixote and some late 60s/early 70s rebelliousness. You can read our review here. This entry was posted in Uncategorized and tagged "are they mad or...", Al Lewis, ambigious ending, Anthony Harvey, asylum, blackmail, Don Quixote, Eugene Roche, F. Murray Abraham, gambling debts, George C. Scott, insanity, Jack Gilford, James Goldman, James Tolkan, Joanne Woodward, John Barry, librarian, library, M. Emmet Walsh, New York City, Paul Newman, psychiatrists, Rue McClanahan, Sherlock Holmes, supermarket, telephone, telephone company. I just watched “They Might Be Giants” on Netflix, and adored it! It’s a good one-and you heard it here, easy to find if you have Netflix!